The above photo shows the four basic sarcoid types: flat, verrucous, nodular, and fibroblastic. 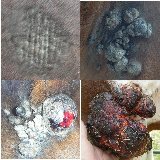 It also illustrates the variation in tumors on the same horse, as all four were present on the same animal. In reality, these tumors affect only the skin and never metastacize to other tissues. With proper therapy (which often includes surgery), especially when caught early, it is very possible to completely remove these tumors. However, each tumor must be evaluated on an individual basis based on location, size, and tumor type, and a specific unique treatment plan established. There is no one treatment that will work on all tumors. Treatment is more than just addressing the tumors themselves, because the virus will remain, allowing new tumors to crop up if other problems are not addressed. 1) Flat (occult) sarcoid: this is an approximately circular hairless area of skin, which is often thickened. They can be easily overlooked or ignored, as they look similar to tack or halter rubs, but the important distinction is that they persist. This is considered to be a low-viral load type. 2) Verrucous (warty) sarcoid: greyish, wart-like, raised mass. These often crack or break off easily (similar to the chestnuts on the legs) and can appear singly or in groups. This is considered to be a low-viral load type. 3) Nodular sarcoid: firm, round nodule, often covered by a layer of normal skin, though they can also be ulcerated. Like verrucous sarcoids, nodular sarcoids can also appear singly or in groups. Size can be highly variable. This is considered to be a high-viral load type. 4) Fibroblastic sarcoid: fleshy mass that often grows rapidly. The surface is ulcerated and bleeds easily, and these are often mistaken for proud flesh due to the appearance. This is considered to be a high viral-load type. 5) Mixed sarcoid: this is a sarcoid that cannot be easily classified into one of the above categories, and has traits of several different types. This is actually quite common. Below are listed the treatment protocols with which I have experience. There are numerous treatment modalities available, so this is not an exhaustive list. Xxterra: This is one of the more well known treatments, and can be effective. Tumor size, type, and location should be carefully considered, because this product can cause small or minor tumors to undergo malignant transformation and become significantly worse. Additionally, it causes a severe and painful inflammatory reaction, and should never be used on or around the head or legs. With successful treatment, large scars will remain. As a general rule, I do not recommend its use in most cases, as I believe that there are better, more reliable methods available. Aldara (Immiquimod): This is an immunostimulant cream that I have used successfully in several tumors. Unlike Xxterra, it does not leave a scar, and does not cause significant pain with repeated application. It is somewhat expensive, and must be used in some cases for an extended period of time, but is easy to apply. Cryotherapy: This involves the use of liquid nitrogen (-320*F, commonly used for freeze branding) to kill tumor cells. It can be used alone or more often in conjunction with surgical excision. Certain locations, in my experience, tend to respond poorly to cryotherapy, and this must be considered. Additionally, tumors can be located over blood vessels, nerves, or other vital structures, making cryotherapy a less viable option, because the deep freeze necessary can endanger these other structures. After the tissue is frozen, it will harden and then slough, or fall off, leaving a bed of granulation tissue beneath. Usually, a somewhat linear scar with white hairs will remain. In my hands, approximately 30-50% of tumors receiving this treatment do have some degree of recurrence. Because of the low cost of cryotherapy, it is often my first choice in very large mixed or fibroblastic sarcoids. In many of these, I expect recurrence, but in all cases, the recurrence is significantly smaller, and more financially reasonable to address with other treatment modalities such as Aldara or cisplatin. Cisplatin: Both an injectible form and a 3mm bead form of cisplatin exist. This is a true chemotherapy agent, so must be handled with care for the safety of all people nearby. Because of this, I avoid the use of the injectible cisplatin, which can inadvertently come into contact with myself, my assitants, or the owner, as injecting into these firm tumors can be difficult. Instead, I prefer the use of specially made 3mm beads containing cisplatin, which are implanted under the skin and release the drug locally. The beads themselves are expensive, though implantation is a rather simple procedure, and have a very high success rate. Some tumors may require an additional treatment. Cisplatin beads may be implanted directly under small tumors or larger tumors excised followed by bead implantation. Scarring is typically minimal, and associated only with the surgical procedure itself. EqStim: This is marketed as an immunostimulant drug that is given systemically. I have used it in several cases, and it does seem to help. It could be useful in horses with one small tumor in an attempt to induce spontaneous regression, but also can be useful in horses undergoing surgical treatment of tumors. Overall improvement of health: This is probably one of the most ignored aspects of sarcoid care. A healthy horse will have an immune system more capable of combating these tumors. Proper dental care, diet changes, environmental changes, and addressing potential vitamin and mineral deficiencies are all important to overall management.